Later on we’ll look at ways that you can increase traffic to your website. Some of those ways will also help with regards to your SEO, while some of the tips included here will give your traffic a direct boost. But to avoid duplication and to keep things simple, these tips are all focused on improving the status of your website and improving its ranking with Google. Indirectly, you may get some hits for you site, and with some of these tips you almost certainly will, but that’s not the main aim. WordPress plugins can help you out with a lot, including SEO. They’re not going to do all of the work for you. Don’t expect these plugins to take the place of hours of work or of an SEO expert. They won’t do anything in that sense. They’ll act as more of a guide than anything else, pointing out problems that need to be fixed and giving you suggestions on how to fix them. This may not sound like a lot, but it’s essential, especially when you don’t really know what you’re doing. Some of these plugins can actually teach you more about SEO, becoming a tutor of sorts. The best one by far is Yoast, which we have already discussed. This is the most common one, it’s one that many top bloggers use and it also has the best features. Yoast can help you to prepare all of your articles and it covers everything that you need. 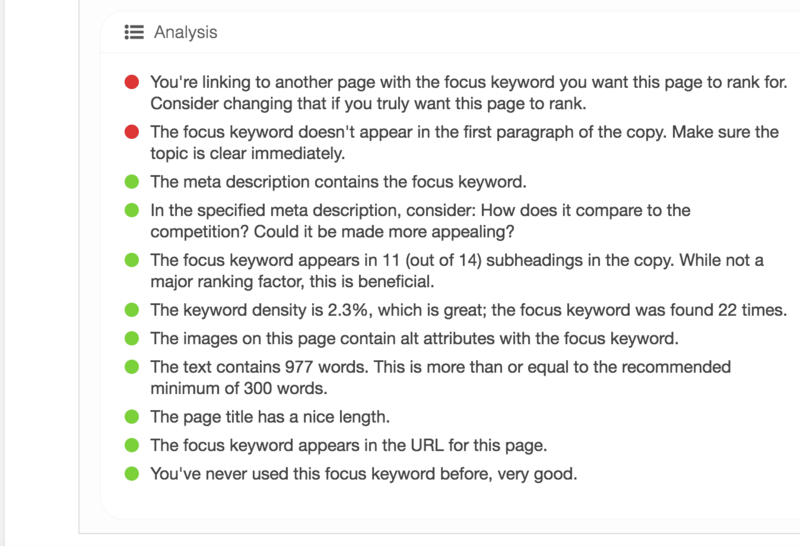 You will find the details underneath every new post and it will immediately tell you the SEO value of any given article, attaching a color dot that ranges from red (bad) to orange (average) and to green (good). Many writers prefer to write all of their articles in a word processor, applying some basic SEO rules while I do. If you operate in the same way ( recommended, as it’s easier to save and store copies of your articles) then it might be easier to upload the first draft and then apply your edits while you’re following Yoast’s SEO instructions. You can also simply write your article straight into Yoast, but if you do this you shouldn’t pay too much attention to the Yoast results early on. If the article is someway away from completion, you’ll get a false set of results. Instead, try to check halfway through and then near the end. If you generally write very well and hit most of these targets naturally, then you can just check on completion. Yoast can help you to prepare all of your articles and it covers everything that you need. Find a relevant image to match (you can download free images from sites like Pixabay. Just make sure everything you use is free from copyright). Rename the image to your chosen keyword and then include this keyword in the “alt description”. You add a caption. These are added to the total word count of the page, so as well as giving you a little extra content, you can also use them to slip-in an extra keyword or two. Upload via the “Text” option and not the “Visual” option, otherwise your word processor will add unnecessary code and complicate things for Google. Ensure the spacing is correct and then add header tags. The easiest way to do this is to highlight your headers, click the “Bold” option, and then replace each “strong” with “h1”, “h2”, “h3” or “h4”. Use the first for your main title, the second for your main section headers, and the others for smaller headers. The first two should always be included; it’s not essential to include either of the other two. Add WordPress tags. This is more about site layout than SEO, so use tags you will use again as a way of connecting similar articles. Add your article to your main “blog” category and to another relevant category. Try to use 3 or less words in your URL, and include your keyword. Although this Yoast report displays two red flags, the article was given a green light on the whole. We have already discussed the importance of writing more than 800 words and even more than 1,000 words if you can. If you go overboard this will show as a warning and it’s one you could ignore. But if you have something that is 2,000 words or more, then you’d be much better off breaking it into 2 articles, using the same keyword for both and simply adding “Part 1” and “Part 2” to separate them. If you have something a little less than 2,000 words and would rather have one article of 1,800 words than two articles of 900 words (understandable) then simply add a small paragraph to the beginning of each article, reminding readers that this is the first/second part; and one to the end, telling readers where to find the other part. This will give you a couple of hundred extra words, allowing you to create two articles of more than 1,000 words. It will also give you some additional internal links. If you write well, you should be able to hit most or all green lights straight away. But a few red or orange lights won’t do you much harm. 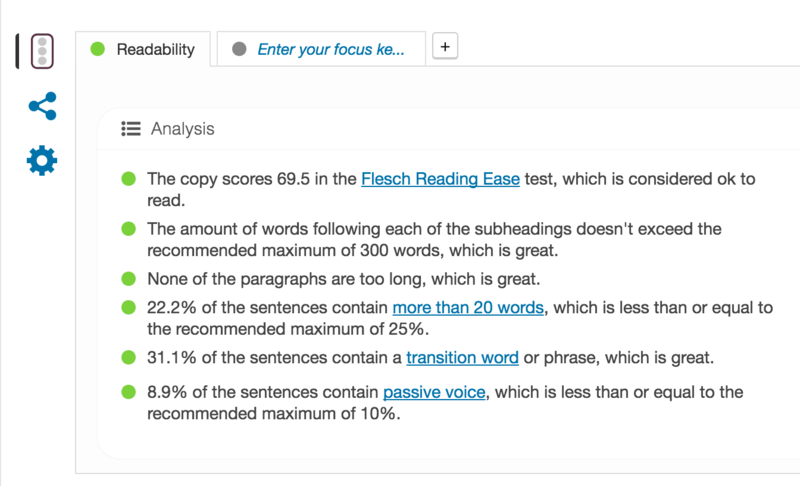 While the readability plugins and the Flesch Reading Test can tell you some things, you shouldn’t rely on them too much, especially the plugins. You could put Pulitzer prize winning articles through these and many would come up red or orange. It doesn’t like long sentences, it doesn’t like long paragraphs and it has a very tight definition of just what “long” means. Use it to get rid of repetition, to shorten paragraphs (just add extra paragraph breaks) and to quickly clean-up the text, but don’t get too caught up with this. Don’t concern yourself too much about this red flag. You can still get a green-light even if this is red. Stop words do need to be minimized though and you should avoid using them in URLs and image titles. You may need fewer keywords than you think to turn this green, but it all depends on the size of your article. Density is about percentage, not a predefined number. In most cases, once you hit the green light then you will be able to add many more keywords before you go over. But again, it’s all about percentage. You should look to include your keywords in at least 1 header, and many more if possible. These are given priority when your site is indexed, and they are also easier to use here. For example, if you’re writing about a movie-star, with headers to separate sections on “History”, “Film Career”, etc., Just change it so that those headers read, “[Actor Name] History”, “[Actor Name]’s Acting Roles” and so on. Have a little think and you will discover many ways you can work your keywords into your headers without them sounding unnatural. One of the things that stumps many bloggers is trying to get the focus keyword in the first paragraph. Even professional writers struggle with this, as it’s just not standard practice for non-SEO writers. The first paragraph is a short introduction at best, and it can feel awkward to include the keyword. Most writers find that they have included the keyword in the second paragraph though, so if you’re struggling, just lump these two paragraphs together. You can also simply pose a question to the reader, using the keyword/title to do so. This works 9 times of of 10, getting the keyword in without sounding awkward. Not all of your articles need to be prepared this way. We have already discussed the importance of having a set number of articles on your site prior to launch, articles that focus more on SEO and serve as the foundation of your site. These should definitely be SEO prepared and you should look to tick every one of those green boxes. You should also make sure that the keywords you use are your main keywords and that they are not duplicated. You can focus on SEO a little with the other articles, but you can afford to be even more niche and a little less exacting. For instance, it won’t matter if there are a few red boxes, if you use “stop” keywords, if you don’t use images, etc., As long as there is enough content, as long as it’s well written, as long as it contains a niche keyword or two and as long as you have those foundation articles behind it, you’ll be okay. *We didn’t do any actual research into these keywords and are merely using them as an example. If you have more foundation articles, which is recommended, then you can add more sports, leagues and/or disciplines. You can also add a different variant to “Betting Tips”. The idea is that these articles cover your main keywords for each major demographic. You’re telling Google that if anyone is looking for betting tips, regardless of the sport or the league, your site can help them. These keywords will a face a lot of competition, so to begin with they won’t rank very highly. But once you start adding some specific keyword articles to the mix, then you will strengthen your site’s reputation, improving its position and bolstering those initial keyword articles. Links are a big part of the Google algorithm and they play a significant role in determining which sites it respects and which sites it doesn’t. It’s a trust thing. If a respected site links to your site, then in Google’s eyes, it must be trustworthy. One link is not enough to drastically alter your site’s status, of course, but if several big sites start linking to you then your PageRank will improve significantly. Sounds easy enough, right? Well, not quite. If you get too many links on too many low quality sites, then Google will assume your site is just as worthless as those sites are. There are also two kinds of links that can be placed: “dofollow” and “nofollow”. The difference, on the surface, is very slight and it only takes one line of code to change a “dofollow” link into a “nofollow” link. But for backlinking purposes, the difference is massive. A “dofollow” link will be trawled by Google and will help to raise the status of your site (or lower it, depending on the status of the linking site). A “nofollow” link will not be trawled. As a result, it won’t have any effect on the status of the linked site or the linking site, and the only purpose will be as a reference point for an article, or as a link that can drive traffic. It’s important to remember this, as we shall discover. So, how can you get sites to link to you? Links are a big part of the Google algorithm and they play a significant role in determining which sites it respects and which sites it doesn’t. 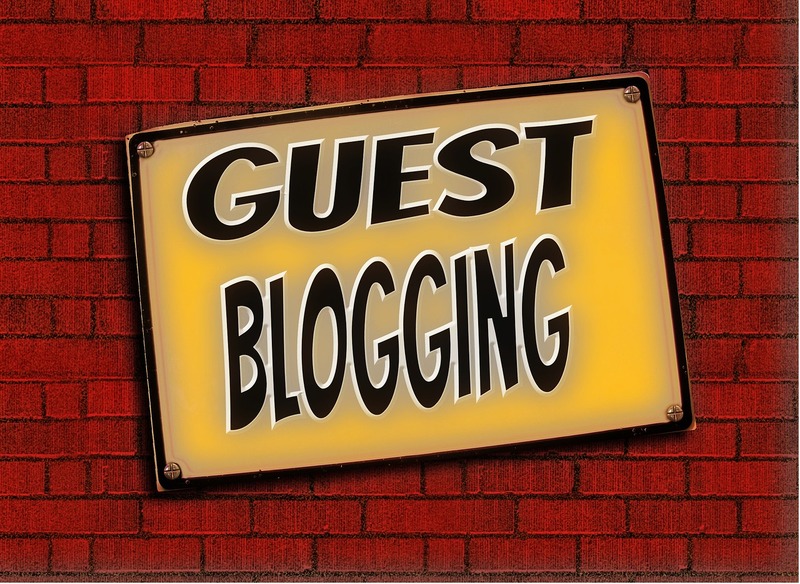 On How to Start a Blog, we don’t do any kind of guest posting. But we’re the exception, not the rule, so shop around and see what you can come up with. A high value website will not post a link to your blog at random, nor will they post a link just because you told them your blog was good. You need to offer them something in return. In a moment we’ll look at ways you can pay for these links, because money is as good of an incentive as any. But you don’t need to fork out a bundle of cash to get what you want and sometimes, if you’re lucky enough, good enough and persistent enough, well written content will suffice. Check to see whether the site you want a link on actually posts links to other sites in its articles. These will either be embedded within the article or listed at the header or footer, where the contributor is noted. You then need to check the Source Code of the page (Right Click>>View Page Source) and find that link. If you see the words “nofollow” within the link code, then this means they probably don’t accept “dofollow” links (there is no “dofollow code”, it’s basically just a link with the “nofollow” tag omitted) and should be ignored. Make sure the article is relevant to their site and yours. Be professional, double check your email for mistakes. Don’t write anything longer than 3 paragraphs. Don’t go overboard discussing your site and don’t beg. Tell them that you can make changes if needed. Give them exclusivity on the article. You can also contact them as a writer seeking a few writing credits. Just ask them if they would like to post the article and tell them that the only thing you ask for in reply is a credit in your name. You can also ask for a link to your blog along with your name, although in such cases you should remove any other embedded links to your site. contact them as a writer seeking a few writing credits. Sites like Forbes and Huffpost, which attract a lot of visitors, post a wealth of articles and have a great PageRank, both hire a number of contributors to keep the content flowing. These contributors are not always paid, but they make money on the side by charging webmasters to post backlinks in their articles. It sounds deceptive, but providing they aren’t packing too many links into those articles or breaking the site rules, it’s okay. It’s a win-win for everybody. It’s not easy to get in touch with these contributors directly and we wouldn’t recommend trying. But you can let them come to you, as they are often actively seeking clients. They need to make money after all. You can also get in touch with guest posters who create a network of these contributors and find clients for them. You can find such guest posters on sites like Upwork, Guru and, to a lesser extent, Fiverr. You have to make sure that the link being offered is “dofollow” (ask them outright, because they won’t be upfront with this and many customers only find out when the money has been paid and the link has been posted) and you have to make sure the site is relevant and has a high PageRank and Domain Authority. As for the cost, it all depends on the sites. But bear in mind that 90% of the people offering you such posts will be middlemen and not the contributors themselves. In fact, most of them don’t even qualify as “middle”men. It’s like a drug trade. You’re the end user and the contributor is the grower. But there are countless national and local dealers stepping on that product and taking their cut along the way. Bing Webmasters Tool (free): This is the Bing version of Google Webmaster Tools and it is similar in many ways, albeit with a few less features. If anything, this is easier to use, but Bing gets a fraction of the traffic that Google gets. Don’t get too caught up in this early on, but by all means signup, spend a little time on it and then come back to it at a later date, when your increased presence and reach means it has more to offer your blog. Moz (paid, but with free trial): A paid subscription to Moz can cost as much as $600 a month, so it’s not cheap. But this is the gold standard of SEO software and covers everything. It will monitor your backlinks (“nofollow” and “dofollow”) your Domain Authority, your site speed, mobile compatibility and everything else. There is also a free trial so you can try it out for yourself. We would recommend signing up for this trial, running a few checks to determine site speed, broken links, etc, and to fix any issues it raises. Use it extensively throughout that first month and you’ll probably not need it again for another few months, at which time you can weigh up the pros and cons of a paid subscription. Google Keyword Planner (free): This is part of Adwords and is something we have already discussed. It’s a program that you should have used by this point, as it can help you to find the best keywords for your articles. It’s free and it’s easy to use. There are some more advanced features that are a little more complicated, but you can ignore them for now and focus on the basics. KeywordTool (free): This is another free keyword tool, and because it’s universal and not owned by Google, it can help you with other search engines. You may actually find this easier to use if you’re not completely clued-up on SEO and keyword research in particular. Small SEO Tools (free): There are a few free SEO tools on these site, all of which can be accessed through your browser. If you’re just looking to retrieve some quick data, from the originality of your articles or guest posts, to a quick backlink checker, then this sort of site is ideal. We’re always very wary of these sites as they are straddling the line between a legitimate service and an annoyance only interested in spamming you or loading your computer full of malware. This one seems okay (for now) but you should always remain vigilant and never download anything or enter any details if/when prompted. Screaming Frog (free and paid options): This is a website crawler designed to give you some insight into SEO on your website and the websites of your competitors. It might be a little confusing at first, but there is a lot to be gained from this software, so stick at it. It won’t fix many problems for you, but it will point you towards them. Woorank (free and paid options): This program offers some insights in your SEO, helping to improve your digital marketing efforts and to optimize each page on all of your websites. There are free options and paid options, depending on how many of the features you want to take advantage of, and at most it costs around $300 a month.